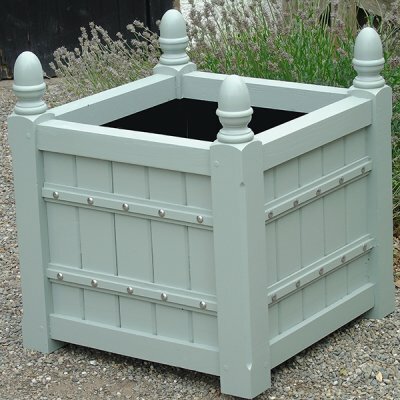 Cambridge wooden garden planters are attractive and solidly constructed planters. All the timbers are substantial and it has attractive finials atop each corner post with stainless steel coach bolts through horizontal straps and side walls. It is suitable for a large seasonal planting display, or shrub. It looks particularly good with a really large palm or fern style plant. 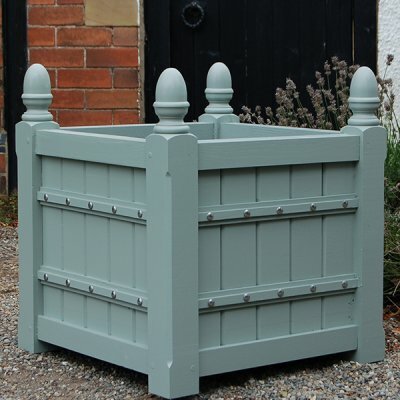 The Cambridge garden planter is constructed with Scandinavian red pine with the internal surface of the planter finished with a thick waterproof paint sealant. Farrow and Ball paint finish. Camellias grow really well in Planters. Growing plants in planters gives you the advantage of being able to grow soil sensitive shrubs or flowers in which ever area you live. Camellias are a case in point. If you live in an area where the soil is not acidic all you need is a planter, Ericaceous compost and off you go. One of our favourites for spring flowering is Camellia 'Fragrant Pink'. It has lovely miniature flowers similar to a peony. The flowers are pink in colour and three to six centimetres across with twenty or so petals with a golden yellow centre. They bloom in profusion with successive flushes over a long period and have a lush evergreen foliage of serrated leaves to which their flowers are a pleasing contrast. They are also scented having a fragrance similar to sweet Osmanthus. Camellias thrive in planters but they do require special care. After three years the growing medium becomes depleted and heavy so the plants should be replanted using fresh compost. Assuming the plant is at the size you require and does not need to go into a larger planter. The roots should be trimmed back thirty to fifty millimetres with a knife. Also make sure there is adequate drainage. One thing camellias really do not like, is wet feet. You should treat your camellias in planters the same way as you would if they were in the ground but with a little more attention.